About 95% of the time, Mr. K and I alternate between two breakfasts: yogurt with labne (if we’ve been to Spokane recently; I have yet to have success making my own) and granola or cold cereal with milk and fruit. Once in a while we’ll get wild and have eggs or pancakes, but mostly it’s yogurt day or cereal day. A few days ago we were out of yogurt because we were too busy skiing to go to town for groceries, so I decided to try something new: making steel cut oats in the Instant Pot. We had some of those in the house for some reason I no longer remember (I think Mr. K got them to try but the simmering and stirring weren’t something he wanted to do in the morning very often). I looked up how to do them a la IP and got them going so they could do their thing while I got ready for the day. By the time we were dressed, the oats were done and wow, they were good. And so easy. I’d made a double batch because that’s how much we had left in the package; between Mr. K and I, we ate them all. I had one bowl topped with fruit and one with fancy sugar that I’m never going to use for cocktails, no matter how much I might think I’m going to be a fancy person one day. 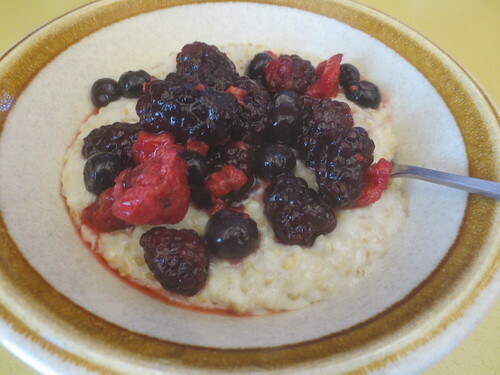 I was so delighted by this turn of events … a healthy hot breakfast that was super easy to make. I think we might have a third breakfast in our regular rotation now. I’ve been thinking of getting myself an IP for Christmas and this is helping convince me that it’s a good idea.